This machine kind of ties in with our recent load of 'January Club' reviews and feature, designed to get you fit and active for the start of the year. 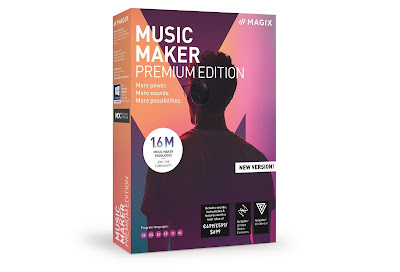 Certainly it was our intention to bundle it in with one of those features, but we found ourselves using it so much we sort of... well... forgot we had to review it. It happens. 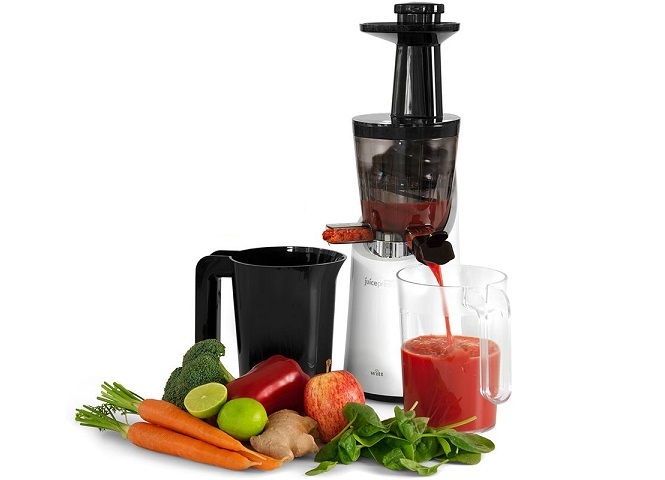 Anyway, now that we're all packed full of vitamins and fibre, lets take a look at the Witt Smoothie Juicepresso. The what? Well, the Witt Smoothie Juicepresso is essentially a combination juicer/smoothie maker, creating smooth beverages far better than a simple blender would. It is a bit of a beast of a machine, being far taller than it is wide, and featuring some very clever ways to keep itself as clean as possible. Because one thing that juicer owners will know is the misery of cleaning the $%&£ing things. The Witt Smoothie Juicepresso is unique in that there are two exit chutes instead of the conventional one; one for the actual juice, and another for the pulp. 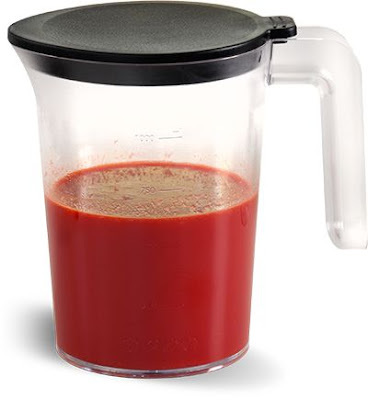 This means that most of the gunk is forced out of the machine into a separate exterior jug to be chucked away (or composted), and the actual juice falls into a transparent decanter. There is no pulp tray that needs to be pulled out of the machine, and very little mess left over on the inside. 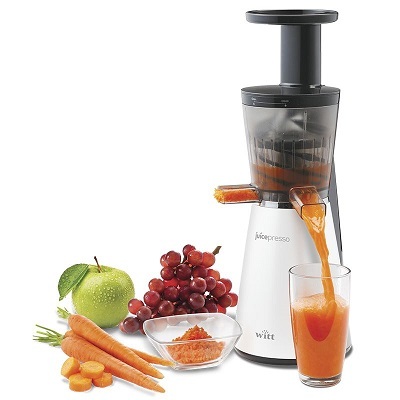 The Witt Smoothie Juicepresso does this by using one of two included screw-like presses; one for juice and one for smoothies. It squeezes the crap out of the fruit and vegetables you put in, rather like a coffee grinder. 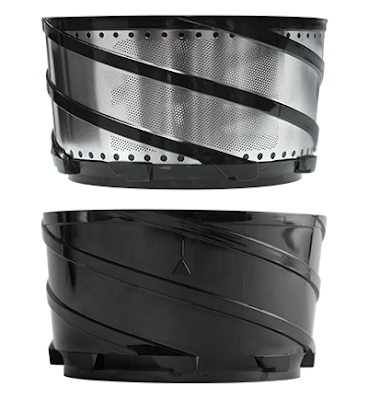 This causes the juice to pass through the mesh of the screw, while the pulp is pushed downwards and forced out. Because of this method, the juicer is by far the best performing of any we've ever looked at, creating better yields of juice relative to how many bits of fruit go in there. Also, as well as giving you more juice, the juice will actually store for longer in the fridge. We had no idea, but apparently traditional blenders add a lot of oxygen to the juice or smoothie, meaning it will go off quicker. By pressing the fruit, instead of dicing it to bits, oxygenation is reduced, so you can keep it for a longer period of time. Oh, and that juice jug also comes with a lid and fits nicely in the door of the fridge (it also fits inside the pulp jug, too, to aid with transporting. Nice). On the juicer itself, the juice spout features a non-drip lip to stop any liquid still in the machine from dripping out after you've removed the jug, and the whole thing is pretty easy to clean after a juicing – which is important. If you've ever owned a juicer or smoothie maker that was a ball ache to clean, you probably found yourself using it less and less. 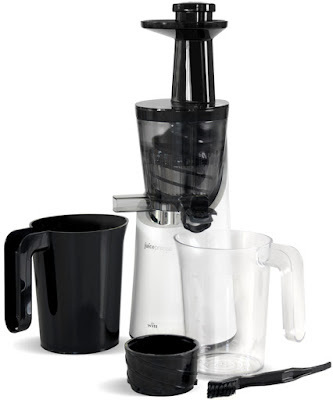 And you'll definitely want to use your Witt Smoothie Juicepresso a lot... as this thing costs almost £300! Yep, three hundred quid. That does sound like a lot, especially with a host of other juicers out there for less than a third of that. However, in our limited experience of juicers, this one seemed to get more juice out of whatever we put in there, simple as that. Sure, you get a nice recipe book included, showing you how to make different smoothies and also sorbets, but the cost really does go into the quality of the juice coming out of there. With the juicing screw fitted, the resulting liquid was just that – a liquid, with all the gritty bits and pulp removed. It tasted just like juice you'd buy in a carton, with the added benefit of it not being stuffed full of sugar or having been frozen in a factory three months ago. Likewise the smoothies tasted great also, with enough of the grainy quality of a decent smoothie having made it through the filter, without it being too thick. 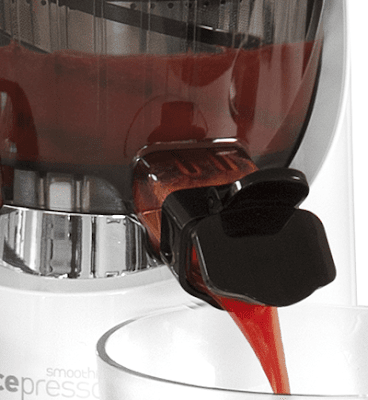 The Witt Smoothie Juicepresso is a big investment, but if you love making your own juice and getting experimental in the best way possible, it's a buy.